Villa Aretousa is located just 250 meters from the black pebble beach of Perissa and offers impeccable and pleasant accommodation with Wi-Fi. 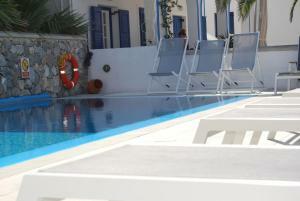 The pool is available from the 15 from May to the 1 from October. 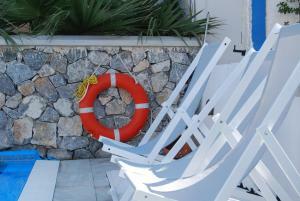 Stays of more than 3 nights include a free pick-up service at the airport or port. Transfers for stays of less than 3 nights or for departure are available for an extra charge. In case of no-show for the free pick-up service, the driver will not wait and guests can request a new pick-up service for an additional fee. This air-conditioned studio offers a cable TV, a fridge and an electric kettle, as well as a laptop computer, available upon request. It also has a large private balcony with views of the pool or the mountain. Some rooms have a safe and a kitchenette with kitchenware. 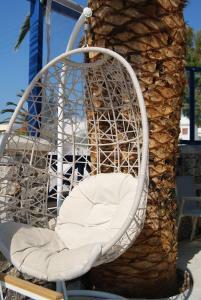 Some present the traditional style of the Cyclades. 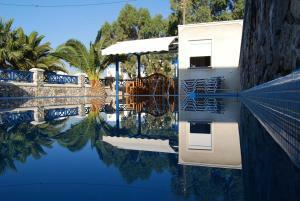 Air-conditioned studio with a kitchenette, a fridge, a safe and a private balcony with views of the pool or the mountain, with the traditional Cycladic-style chapel and the ancient Thera. Please note that this type of room is located in the basement. It has cable TV, a kitchenette with kitchenware, a fridge and a private terrace to relax under the sunny sky. 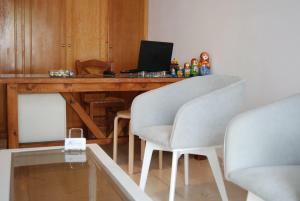 Air-conditioned room with a double bed, cable TV, a refrigerator, a safe and a private balcony. It has no kitchen area. Attention: some have sloping roof, so they are not recommended for people who measure more than 1,90 meters. Typical Cycladic room with wooden staircase to the mezzanine, kitchenware, fridge, TV, safe, electric kettle and private balcony. Only in this type of room can a cot be added upon request and upon confirmation by the property. This room has air conditioning, TV, fridge and windows that open onto a furnished terrace where you can have breakfast or have a snack. This type of room is not adapted for people of stature greater than 1,90 meters. There is no kitchen area. It is not recommended for 2 couples due to their limited privacy.